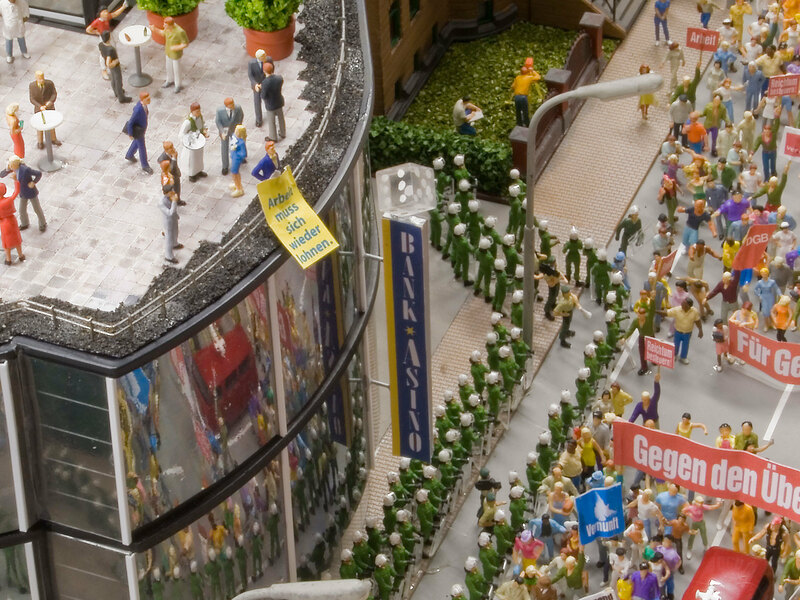 The model world of the Left Party is not a dreamland, not a Utopia. It is set in the here and now, reflects political themes and disputes and shows where the Left is active: On the streets, in the midst of life. 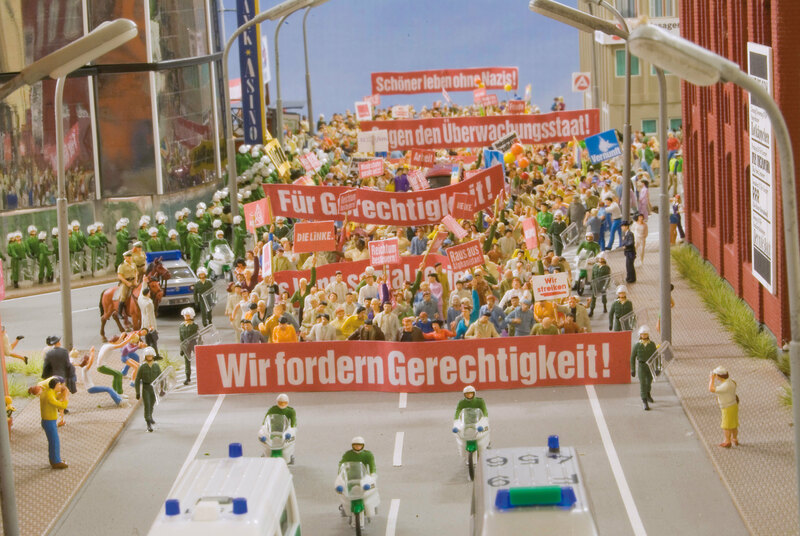 In the city, where the glass palaces of the finance and banking world are hinted at, as well as the mixed residential areas with small shops, green spaces, alternative and autonomous living environments, different people in a large and colourful protest march express their demands in a peaceful and creative manner. At the front of the protest is a red banner with the slogan 'We demand fairness'. 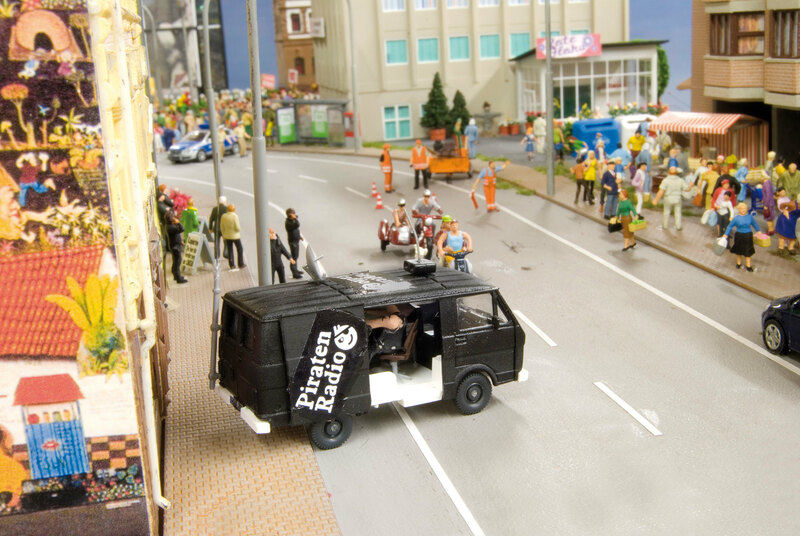 Demonstration: The street protest serves as the central theme in this miniature world. Although the protest is peaceful, powerful police forces are protecting a bank. The correct questions are asked: Who is responsible for the economic and fiscal crisis and who has to cover the costs? Why are billions given to save ailing financial institutions and inconceivably high bonuses paid to incompetent managers? Why isn’t there more invested in our future, in our education? How come those responsible for the greatest expropriation of the people get a pass while peaceful protestors are filmed by the police? 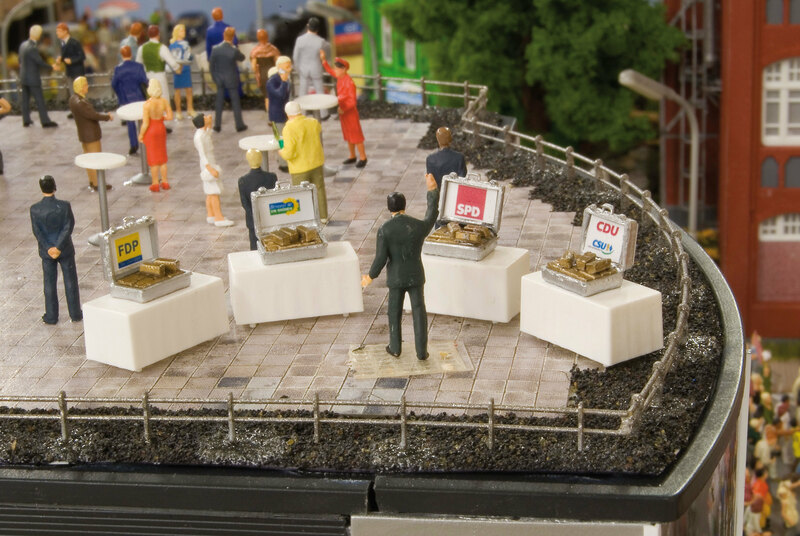 The advertisement on a copy shop says: “Copy the ideas of the Left Party here”. Mrs Merkel, Mr Steinmeier and Mrs Roth are already standing in line. Since the Left Party is represented in the parliaments, many of their demands have been copied by the other parties. For example, the idea of an extensive statutory minimum wage similar to other European countries. Politics and the industry have a get-together. The protest on the street mildly irritates them. The FDP poster with the words ‘Effort must be rewarded’ is – in light of impending mass unemployment, decreasing wages and a growing minimum wage sector – a highly cynical statement. A theatre is closed down. There is not enough money due to lowered taxes for corporations and high earners, for which the SPD, Green Party and the CDU are responsible. We demand a wealth tax and a tax on the speculative stock-market. Mr Ackermann is entertaining guests. With Champaign and snacks, generous donations are given to the CDU, FDP, SPD and the Green Party. Are their political decisions influenced by this? At least we know why the super-rich and industry lobbyists hate us. The voters know it, too. And it fills us a bit with pride. 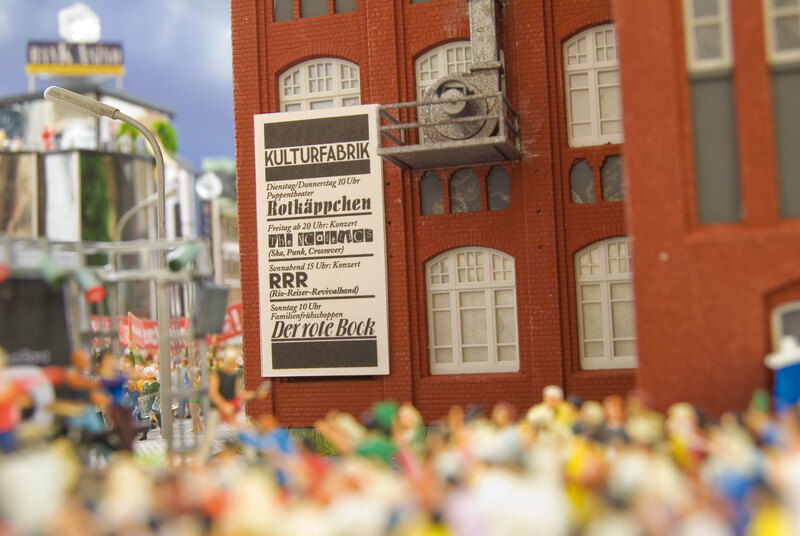 A former industrial building is now a culture factory. The inhabitants of the area have a variety to choose from. Today, there is a Rio Reiser revival band. We demand the preservation of cultural islands, which are of immense importance to social structures and the quality of life. Mobility has become of utmost importance in our society. No one shall be excluded. Busses and trains must remain affordable – especially for those who have only little. Privatisation must be prevented. Private owners’ expectance of higher profit margins may lead to an increase in prices and safety concerns. 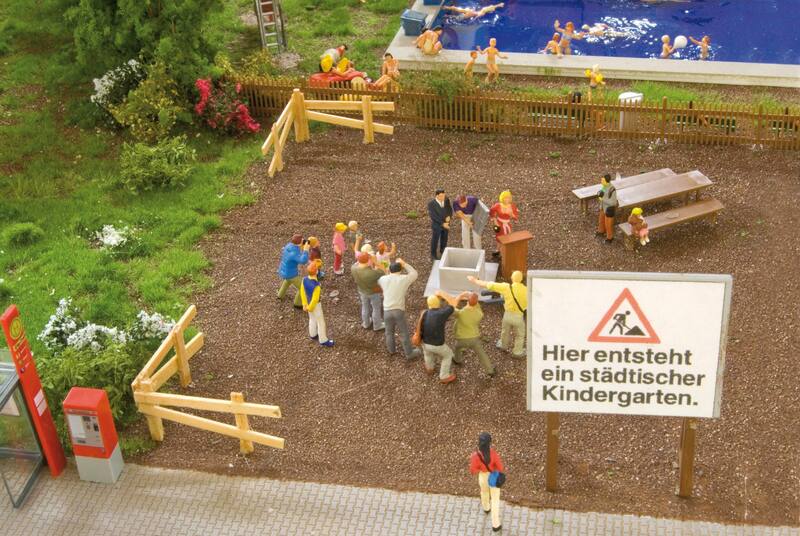 The laying of a foundation stone for a communal kindergarten raises hopes. We demand enough places for everyone who wishes to make use of childcare. We demand more educators and more money for their hard work. And we also demand a cost-free access to education from day care to university. A true district also consists of Turkish greengrocers, businesses and restaurants as well as an occupied house. We support these spaces of a self-reliant way of life. 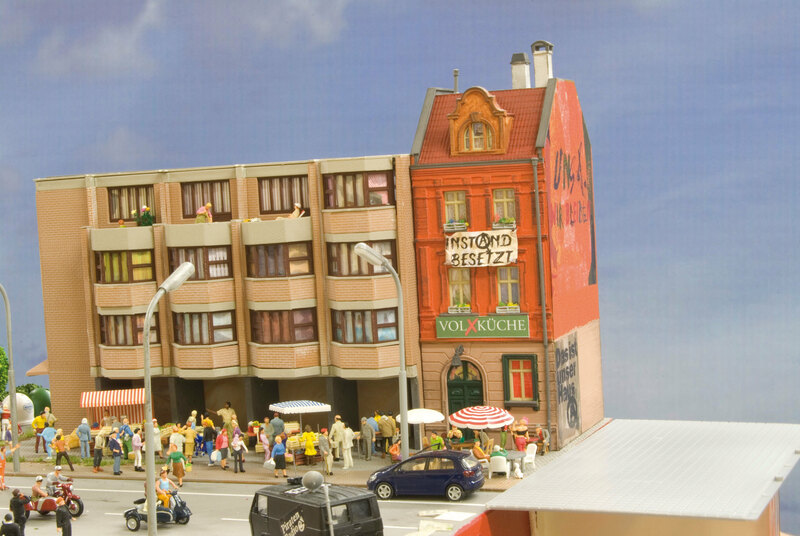 The Volxküche (Peoples Kitchen) is an asset to a peaceful and social coexistence. Pirate Radio: Newspapers and private commercial stations belong to only few media corporations. The public radio is controlled by the established parties. In an information society, the power must not lie in the hands of few. Information and knowledge must be accessible to all and spread by all. 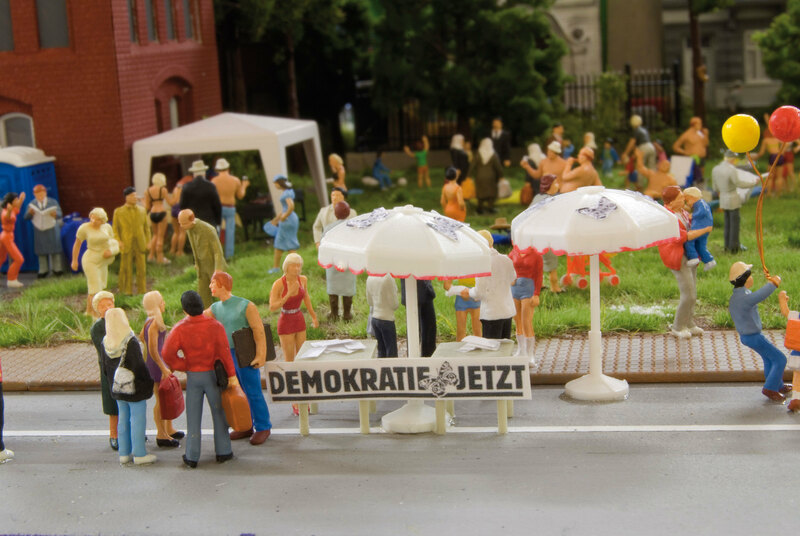 The Left Party campaigns for more citizen participation and lowered barriers for referendums. It is the only way to communicate democracy once again. This has succeeded in Berlin, where The Left Party is part of the government. There, the people have more rights to participate with the implementation of peoples’ referendums and participative budgeting.